If You Could Have Any Boston Dynamics Robot, How Would You Use It? Today's big news is Google buying Boston Dynamics. Lazy writers, myself very much included, spent the day making tired old jokes about the dawn of the machine uprising. But there's gotta be an alternate fantasy, where the robots do something more awesome than overthrow their creators. Let's dream one up together! Pick a robot from Boston Dynamics' current lineup. Hell, pick three — cost is no object. How would you use them? Maybe Big Dog with a baby seat, the world's most badass stroller? How about SandFly as a hurtling dumbwaiter to send your clean laundry up from the basement to your window? Or dress up Atlas and take him to the prom! The possibilities are only limited by your imagination, and the creative overkill you can conjure up to justify using DARPA equipment as the muscle behind the world's first mechanized sedan chair (hmmmmmm). 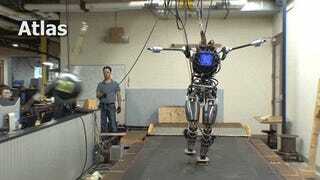 How would you use a Boston Dynamics robot?